Because a baby’s skin is so delicate it is a good idea to dilute all essential oils before applying. There are some exceptions and plenty of moms who have used some oils “neat” (undiluted) without any problem, but since diluted an oil does NOT dilute the effectiveness, I always prefer to dilute my essential oils. A good rule of thumb is to dilute one drop of essential oil with 1 tablespoon of a carrier oil such as coconut or olive. Avoid diffusing strong essential oils (like cinnamon, peppermint, or oregano) in the baby’s room. It’s also recommended to cover your baby’s socks after applying essential oils and to avoid putting oils on the baby’s hands so that the oils don’t end up in your babies mouth. 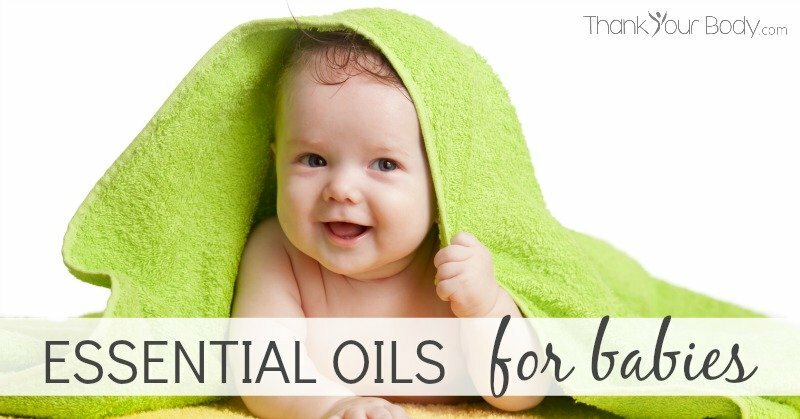 Here are just a few favorite uses for using essential oils for babies. Healthy Tummies (To help with babies gas): Mix 1 drop of Roman chamomile and 1 drop of orange with 2 tsp. of a carrier oil. Add 1 tsp of the mixture to warm bathwater, and stir the essential oils into the water with your hand before bathing the baby. Healthy Immune System: Diffuse 2 drops of melaleuca, lemon, or lavender at bedtime and again during the day. Mix 1 drop of melaleuca, lemon, or lavender with 1 Tbsp. of a carrier oil. Use a small amount to massage your baby’s upper chest and back at each diaper change. Peaceful Babies: Mix 1 drop of lavender with 1 Tbps. of a carrier oil. Gently massage a few drops of oil into your baby’s abdomen, rub in a circular motion clockwise (following the direction of the colon). Healthy Sinuses: For relief during daytime hours, diffuse 1 drop of lavender or melaleuca oil. Healthy Respiration: Mix 1 drop of lavender with 1 Tbps. of a carrier oil. Rub a small amount on your baby’s chest and back. Healthy Scalps: Combine 2 Tbsp. of coconut oil with 1 drop of lemon and 1 drop of geranium oil. Apply a small amount of this blend on the baby’s head. Happy Babies: Place a drop of lavender of Roman chamomile into your palm, rub hands together, and then let the baby smell the oil from your hand. Don’t let the baby touch the oil. Healthy Bums: Combine 1 drop German chamomile oil and 1 drop lavender with 1 drop whole milk (breast milk would also work). Add the mixture to bathwater and swish around before bathing baby. Keep oils away from your baby’s eyes and face. Happy Mouths: Mix 1 drop of Roman chamomile oil or lavender with 1 Tbsp. of a carrier oil. Use a small amount to gently massage the outside of your baby’s face along the jawline. *As a reminder, I only recommend Young Living essential oils. And I highly recommend getting the premium starter kit that comes with 11 of the most popular oils including lavender, lemon, and frankincense (all of which I use a lot with my baby!). Learn more here.